Epic Games mines Toy Story for character motivations. The Gears of War series isn't exactly renowned for its sweeping narrative and thoughtful character development, opting instead to model guns with chainsaw bayonets. Epic Games wants to change that in its upcoming title Gears of War: Judgement by seeking help from Pixar's storytellers. A Pixar story director paid a visit to the developer's HQ to run a one-day workshop on how to tell a good tale, according to Epic Games' producer Rod Fergusson. Staff took notes from the animation studio on how a story is conceptualized, with a focus on storyboarding techniques. Epic also learned how to develop characters from power-armored meat sacks into people that actually experience emotions like love and fear. Fergusson uses Toy Story's protagonist Woody as an example. "Woody's motivation through all three of the Toy Story movies were about the fear of abandonment, so every movie was about that," he says. "That's something we think about now in terms of our storytelling. We think 'what are the character's motivations and how do we reinforce that? And how do we use that into our storytelling?'" 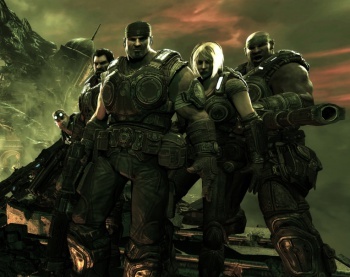 The plot line for Gears of War has suffered criticism in the past. Dead Space's story producer Chuck Beavers previously stated that "it's literally the worst writing in games" (a statement he later clarified). Epic's Cliff Bleszinski said earlier this year that he originally intended the cover-based shooter to be similar to Band of Brothers, and that he wanted to evolve the franchise to feel more like Christopher Nolan's films. The lessons learned from the workshop should make for refreshing changes to future narratives and a departure from repeated requests for Jack to rip that door.